Yet another week has just flown by and we now find ourselves in the bitterly cold month of December (unless you’re one of the lucky ones enjoying the warmth of summer in Australia). As it’s the weekend, Team Nintendo Life has got together once again to talk about which games we’ll be enjoying over the next few days. Feel free to read through our posts below, and then join in yourself via the poll and comments section. Enjoy! Still playing Pokémon: Let’s Go, Pikachu! this weekend, as last weekend was a bit of a wash with the Thanksgiving holiday stateside. I’ve earned four badges so far – currently avoiding the Team Rocket hideout in Celadon, though, because I know it’s going to be a long grind with a lot of battles. I just keep going to the department store and buying more accessories in the meantime… Fair warning: my life is consumed by Pokémon, and will be for some time. Earlier this week, a friend of mine incredibly kindly let me join his family plan for the Nintendo Switch Online service (I’ve been hesitant to buy my own subscription as it just didn’t feel worth it for my own gaming lifestyle). Thanks to this, I’ve finally been able to allow myself back into Splatoon 2 and I had forgotten just how amazing the game really is. I hadn’t played it for a good five months or so until this week, so I nervously dipped my toes back into the safe (and rankless) Turf Wars at first. 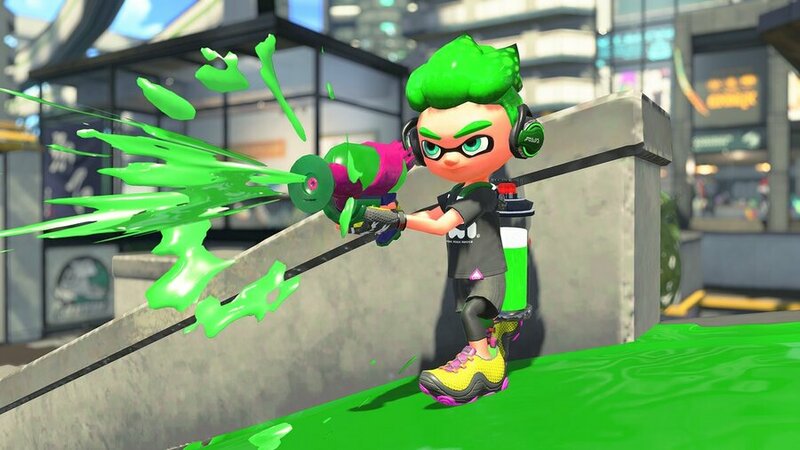 Fast forward a couple of days, though, and now I’m right back in the heart of the ranked games; I need a bit of practice to get back to my best, but I’m enjoying every splat, every clever play, and every juicy victory as they come. Oh Splatoon 2, how I’ve missed you. This weekend I plan to spend every second I possibly can in Pokémon: Let’s Go, Pikachu! because I know I likely won’t be returning to it for a good month or two when Super Smash Bros. Ultimate finally arrives next week. I’ve got to admit the streamlined approach of these Let’s Go games has really grown on me. The new entries have even encouraged me to start playing Pokémon GO on mobile again. When I’m not focused on becoming a Pokémon master, I might sneak in a quick session of Horizon Chase Turbo. I also downloaded the Sega AGES version of Out Run from the eShop earlier this week, so I’m sure I’ll make some time for that as well. A new month is here – a smashing month if you will – and this is the last weekend before my whole life is shaped by a certain release next week. Thus the time has come to complete the last chapter of Valkyria Chronicles 4, rounding up one of my personal GOTY nominees with a bang. Shmup fever is running high due to timely eShop releases of R-Type Dimensions EX, Stardust Galaxy Warriors: Stellar Climax and the utterly brilliant Rival Megagun, and there’s no excuse to neglect my driving skills with more GRIP and Road Redemption sessions scheduled as well. Speaking of those same skills, it probably won’t surprise you that my game of the week is Horizon Chase Turbo. In fact, it was already another of my personal Game of the Year nominees and I am very happy to see the Switch version running without compromise when compared to the PC version I picked up earlier this year. Blue skies forever! This weekend I’ll be picking up my recent save file of Civilization 6. My goal on Saturday is to end a trade dispute between India and France, though this is complicated by recent international tariffs that were imposed due to a land dispute on the Mumbai border. All of this is really straining relations between these two world powers and, more importantly, all their respective city-states. My advisors suggest that not somehow aussaging these economic sanctions could ultimately lead to a decrease in population for my local Brazilian cities if, in fact, an unintended loss of tourism came to pass by the feared lack of luxury resources and that consequential loss of income. I’m looking into it, but it’s possible the only workaround is a casus belli that my citizens can rally around; perhaps a religiously imposed conflict that plays into the return of the Great Prophet, a unit I recently received after winning a wonder race against Theodore Roosevelt. It’s very likely, however, that the physical fallout from even a popular conflict may ultimately impact my population just the same, as casualties of war could mount, considering the geographical impact the mountain range bordering my civilization to the west imposes. Or just maybe, I might expand my civilization to the north to forgo this, though I worry this may anger neighboring countries who are still upset over my autocratic leanings. Ha ha, just kidding guys! I’m totally just playing Let’s Go! Pikachu again.